When searching for the perfect theme for your WordPress site, it’s often recommended to choose a premium theme rather than a free theme. But sometimes a premium theme is much more than your project needs. Free themes don’t always come with the features you might be looking for, but there are free themes available that are high quality, feature-rich, and perfect for what your business website needs. 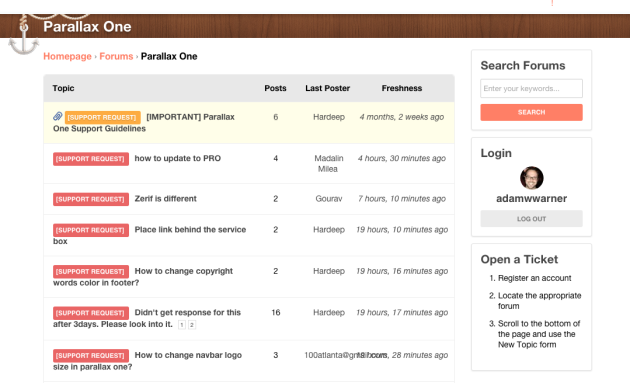 The Parallax One theme from ThemeIsle is one those worth taking for a spin. This theme was developed by the team at ThemeIsle, a well-known and respected theme and plugin development company. In terms of downloading and installing a free theme, this is important to know because it means you can trust that the theme was developed with coding standards in mind. It also means that you can be assured there’s nothing nasty hiding secretly in the theme code that could be detrimental to your business. 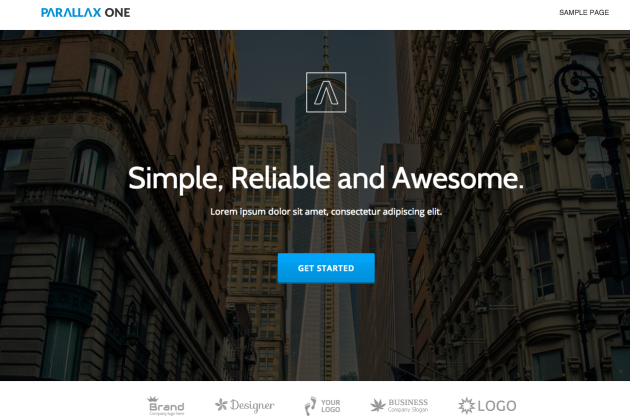 I very rarely recommend downloading a free theme from anywhere other than the official WordPress.org theme repository, but I’m confident in recommending a free theme downloaded from the team at ThemeIsle. Let’s talk about features. 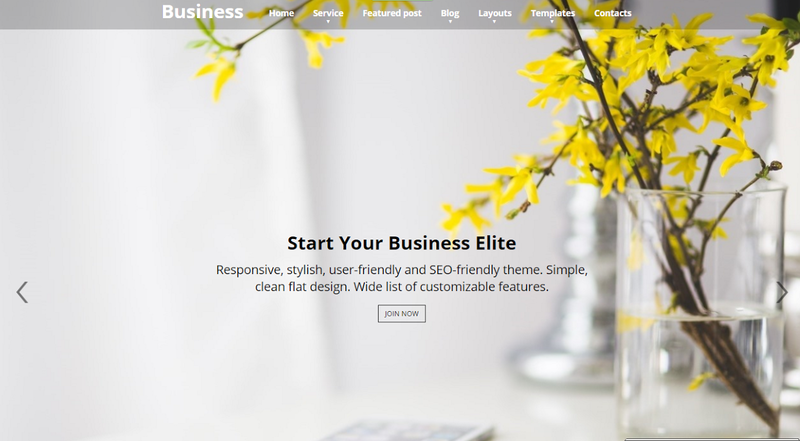 This theme boasts some nice features and customizations options and many are specific to business websites. 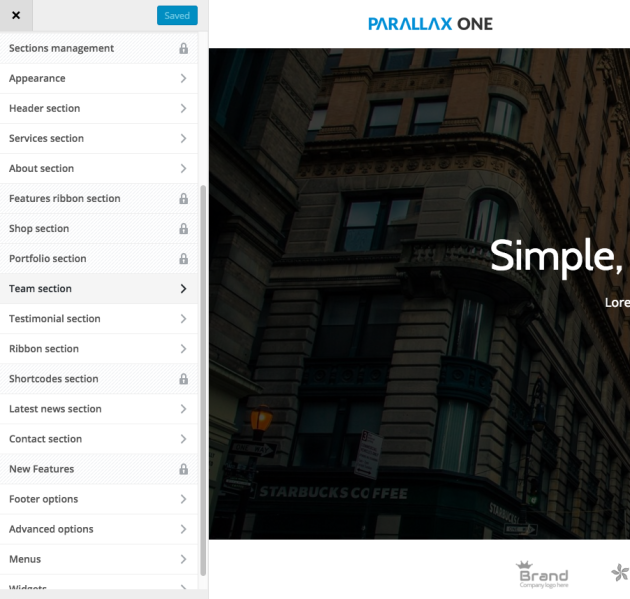 Here’s a summary of features of the Parallax One Business theme. You can learn more about these features here. This theme is downloaded from the ThemeIsle website. In order to access the theme files, you need to create an account. 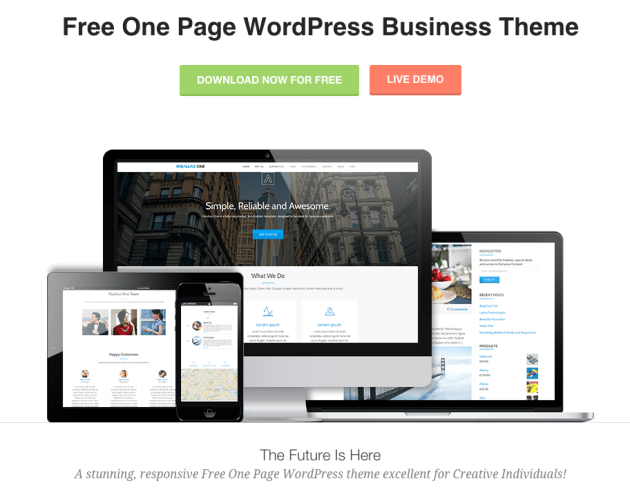 This is because ThemeIsle also offers premium themes and plugins and this free theme is accessed just like any other purchase on their site, just at no charge. After creating an account, you’ll be redirected to your account page listing your available downloads along with links to documentation. Click the orange DOWNLOAD FILES button and you’ll be taken to the actual download and documentation links. Now click the Download button to download the theme .zip file to your computer. ThemeIsle also provides you with an XML file containing sample content you can install to help jumpstart your theme setup. As a user, this is something I really appreciate. I work with A LOT of themes and although some areas of setup are similar, each theme tends to provide settings and options that are not always the same as you would expect. Being able to import sample content easily and then work backward in editing that content for your needs helps me streamline my website development time. In order to import the sample content, simply click the Sample Content link and download the resulting XML file. After activating the theme, you’ll see a notice to install a few recommended plugins. 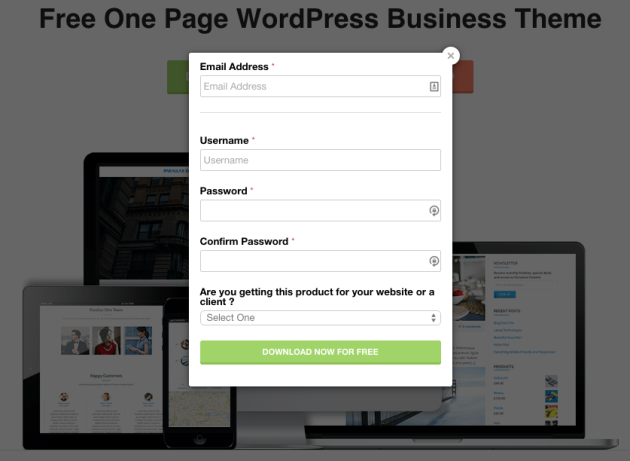 These plugins include two from the .org plugin repository and one that is pre-packaged with the theme. 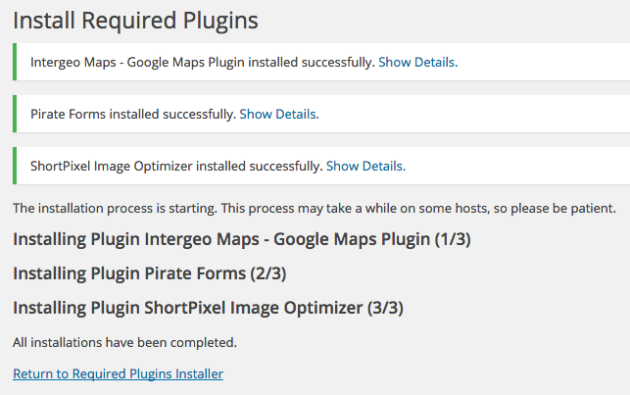 Both the Intergeo Maps and the Pirate Forms plugins are also from the team behind ThemeIsle. Simply select all three plugins and choose Install from the dropdown menu. Now that you’ve installed the recommended plugins, you need to activate them. Click the Return to Required Plugins Installer. Next, select all three plugins and choose Activate from the dropdown menu. If you look at your front page before doing anything else, you’ll see that it matches the theme demo. Every section is already there, complete with text, images and icons. Again, this is a nice user experience because I can see what the theme is supposed to look like right away and can start working my way through each section in order to edit the content for my individual needs. I was expecting the elements of front page to be edited using only Widgets, but I was incorrect in that assumption. Every content area of the front page is managed through the Customizer and it’s here where you can edit the text, logo, images and other elements of the main page. It’s important to note here that as I looked at the available customizer options, I noticed that some had a padlock icon next to them. This is because these areas are only available in the Pro version of the Parallax One theme. They call this version Parallax One Plus. You can learn more about those additional features here. Not having access to these settings was definitely not a show stopper because I had access to everything I needed for my purposes, but if you need to gain access to these additional features, you should consider upgrading. I’ve noted the Pro-only settings in the list below. The available customizer settings include the following. Documentation: I found the documentation to be very satisfying and complete. 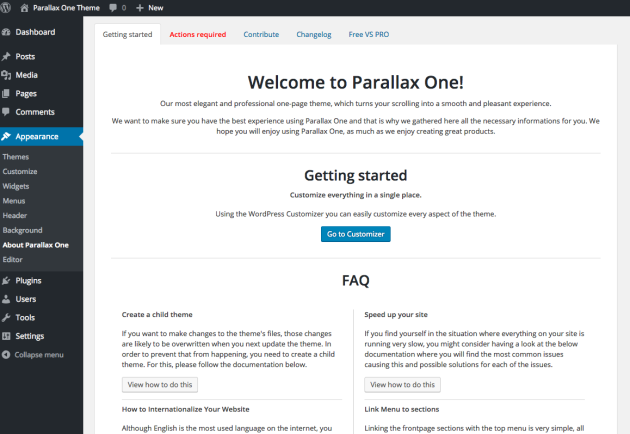 There is a convenient menu link found under Appearance > About Parallax One which offers a nice overview of the theme complete with a link to the Customizer to get started right away and also an FAQ section with links to documentation about setting up specific sections. As I indicated previously, setting up the front page of the site is done with the Customizer. As you start editing you’ll soon come across the need to setup your menus and have them link to the different sections of your main page. This is done by assigning section anchors to your menu items. This is not something that newer WordPress users would know how to do right away, but it’s very easy and they’ve put the directions for doing that in the FAQ section as well. Support: I didn’t need to use support at all, but I did investigate how support was given and I was happy with the process. Support is provided through individual forums for each theme and plugin. If you recall, I needed to create a user account in order to download the theme and this same login gives me access to the forums without needing to create a separate account. Pricing was great, it’s a free theme! One caveat is that you need to create an account in order to access the download, and subsequently your added to an email list. However, I think this is not only necessary for easy access to the forums right away but also a decent trade off for gaining access to a well-coded and high quality theme for free. I found this theme to be a great option for getting started with a professional looking parallax-style theme. It meets the needs for many business owners who want to display their services, testimonials, and location with an easy and clean design. It also allows for several customizations out of the box without getting overly technical with its instructions. All of the settings were neatly organized within the Customizer with the exception of needing to edit your menus to add the links to the individual front page sections. 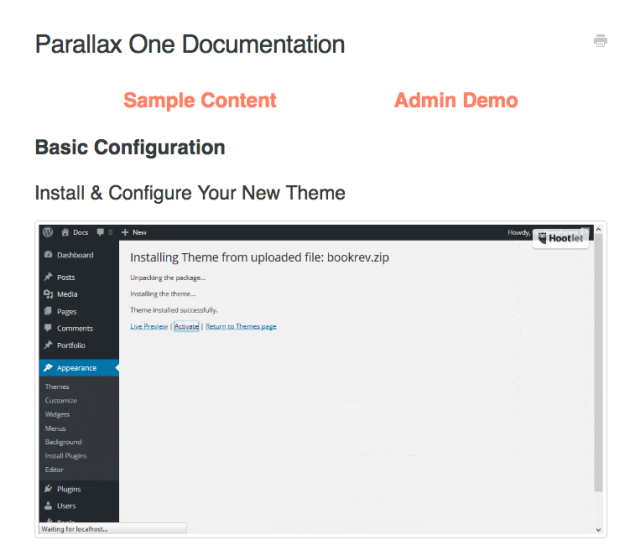 However, the instructions for this were also easily found within the FAQ section of the About Parallax One theme welcome page. If you’ve been looking for an easy and free theme for your business that includes the visual parallax feature, Parallax One delivers. Some say parallax themes are not good for SEO, what is your take on this? Marius from Themeisle.com here, just wanted to give away my 2 cents. There is no connection between Parallax and SEO, those “myths” are based on websites that have little content. That’s mainly because they are loading most content through some scripts that Search Engines cannot understand. Parallax One just uses one parallax effect for background, everything else is clean HTML code which search engines can easily understand. Furthermore, the main page uses header tags properly for SEO optimized content. The homepage is created so you can add plenty of content on it, thus avoiding any “thin content” penalty (Google Panda algorithm). Another reason people suspect Parallax websites are not good for SEO is the loading speed (which is known to be a ranking factor for Google). This is only true for websites that are heavily using parallax scripts (or just about any other script that increases loading time), not the case with Parallax One where the effects are minimal. Another argument people have been using is that some parallax websites are not mobile friendly (responsive)… definetly not the case with Parallax One. I hope I’ve been of help, let me know if you have any questions. Thanks for your feedback and making this clear for everyone Marius. We’re glad to know that you’re using our theme. It is not free, you cant customize properly without purchase the PRO version, SCAM. Hi, what customisations don’t you have access to? And which PRO version are you referring to? Thanks for clarifying that Jeroen.